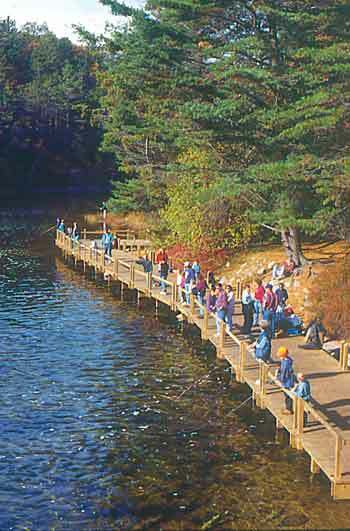 The State of Michigan offers its residents and outstate visitors two Free Fishing Weekends per year. According to the Michigan Fisheries Department (517) 373-1280, the February date is always the weekend before President's Day, and the June date is the weekend following the first full week of June. The Winter Free Fishing Weekend has occurred since 1994 as a way to raise awareness of Michigan's vast aquatic resources and fishing opportunities. There are over 3,000 miles of Great Lakes shoreline, 11,000 inland lakes and uncounted miles of rivers and streams. In 2019, the free fishing weekends are scheduled for February 16 & 17 and June 8 & 9. For both days, all fishing licenses will be waived, but fishing regulations still apply. Enjoy great fishing on inland lakes and all five Great Lakes. Some of the best fishing is right here in West Michigan, with salmon, trout, walleye, and pike in plentiful supply. Whether you're an experienced angler, or want to give it a try for the first time, these two weekends offer the opportunity for great fishing fun. Looking to rent a boat for the free fishing weekend in June? Follow the links below for local boat liveries and marinas.